Autoship every 1 Month 2 Months 3 Months 6 Months and save 15% on your first order! What's this? Learn How You Can Benefit Today From the Essential Mineral Selenium! Selenium is an essential trace mineral that supports a healthy body in many ways. It’s critical for the thyroid gland, supports the immune system, is essential for metabolic pathways, and soothes redness and swelling in the body. It’s even important for reproductive health, DNA production, and eyesight. As an antioxidant, it helps fight free radicals and might even be called a super antioxidant because it supports other antioxidants. One of its most valuable roles is supporting the production of glutathione peroxidase, a critical antioxidant enzyme that protects the thyroid and even helps recycle vitamin E and vitamin C into active scavengers of free radicals. Global Healing Center’s high-potency selenium capsules are made from 100% certified organic mustard seeds and each serving delivers 200 mcg of food-derived, vegan-friendly selenium for a highly bioavailable source your body can use. Selenium is an antioxidant that defends against the free radicals that damage cells and lead to premature aging. Selenium’s antioxidant status also supports the immune system by helping to create important antibodies. Like iodine, selenium is important for normal thyroid function. It’s necessary for the production of thyroid hormones; a selenium deficiency can negatively affect hormone balance and thyroid function. Selenium’s antioxidant action also helps protect the thyroid from free radicals. Normal cardiovascular health requires adequate selenium. Selenium can benefit heart health by soothing oxidative stress and supporting normal circulation. Nearly every other selenium supplement on the market is produced with synthetic selenium. Global Healing Center’s selenium extract is different. It’s a whole food form of selenium extracted from certified organic mustard seeds. Food sources allow for faster and easier absorption. 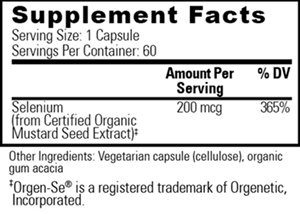 Each high-potency capsule delivers 200 mcg of highly bioavailable, organically sourced selenium. Global Healing Center’s readily absorbable selenium formula is made in the USA from globally sourced ingredients at a state of the art manufacturing facility equipped with all modern equipment that adheres to cGMP guidelines and has achieved ISO 22000 certification -- the highest in food safety. Soil levels can vary dramatically from one region to the next. Generally, people who live in areas with high selenium levels in the soil enjoy better health. A single Brazil nut provides enough selenium to meet the daily requirement for an adult. Water is not a significant source of selenium. A number of serious health conditions are associated with low selenium levels. Selenium deficiency might be associated with a drop in brain function. Selenium is one of the body's primary antioxidant enzymes and protects normal cell function by scavenging harmful free radicals. Supports normal thyroid and immune function in healthy individuals. Has a binding effect to help detoxify metals from the body. Encourages normal oxygen levels in the heart. Supports healthy bones and joints. Required for the production of prostaglandins that promote healthy blood flow. In synergy with vitamin E, selenium supports energy producing cells. We are sure you will see and feel the health benefits of Selenium. If you are not satisfied, just let us know and we’ll send you a prompt refund. Why is this the Best Selenium Supplement Available? The selenium is extracted from organic mustard seeds with water. No solvents, excipients, or carriers are used. Food sourced for faster and easier absorption. Readily absorbable, premium formula is made in the USA from globally sourced ingredients in a state of the art manufacturing facility. No artificial ingredients or additives of any kind. Each serving delivers 200 mcg of this essential trace mineral. 2. Why is consistent consumption of selenium important? Selenium is a trace mineral and we only need a small amount of it. However, because it plays a role in many important functions, it gets used quickly. A selenium supplement can ensure regular and consistent availability of this important nutrient. 3. Why is mustard seed used? Mustard seeds are an excellent, vegan-friendly source of selenium and other nutrients. In fact, Global Healing Center’s selenium extract even offers cofactors and co-nutrients from the mustard seeds that help the activity of the selenium. Some people advocate taking selenium with vitamin E since each encourages the absorption of the other. Be advised that some gastrointestinal disorders can negatively affect selenium absorption. Avoid synthetic forms of selenium, such as selenium selenite, which can negatively interact with other important nutrients, such as vitamin C.
Get Started and Support Your Health Today With Selenium! Selenium is an essential trace element that's essential for many body functions, including thyroid and immune system support. Added as a flow agent, Global Healing Center revolutionized the supplement industry by refusing to use toxic fillers, binders and excipients like magnesium stearate. Dr. Group researched many substances and tested all natural approaches and found organic acacia gum to be the superior option. Kosher certified vegetarian capsules are used instead of standard drug capsules that are composed of protein sourced from bovine, porcine, equine, and even fish. Take one capsule daily, preferably with food, or as recommended by your healthcare practitioner. Keep out of reach of children. Consult your healthcare provider if pregnant, nursing, or for any additional concerns.